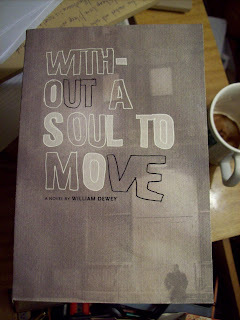 Lawrence and Gibson is proud to announce that William Dewey's Without a Soul to Move shall be available to the genial public from 5pm on July 5th at Unity Books, Wellington. Join us and Unity Books in joyful celebrations. The book was written in numerous cities across the United States and Aotearoa. Without a Soul to Move is Will's second novel and his first from Lawrence and Gibson. Thanks to Lee and Miss Jochim for design assistance, Rebel Press and NZ Print with printing and pressing assistance. With luck, Mr Dewey won't break another bone before the launch. Safe and well, safe and well. Also look out for a feature on Mr Richard Meros in the New Zealand Listener over the coming weeks. We'll link to it if possible, when released.